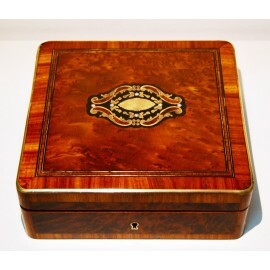 Box Napoleon III, half of the 19th, of different marquetry of wood species, mother-of-pearl and brass. DIMENSIONS: 19 X 19 X 6.6 cm. Antiques box Napoleon III, half of the nineteenth century, of different marquetry of wood species, mother-of-pearl and brass. Good state of conservation.